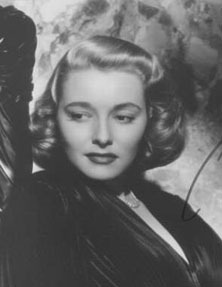 Patricia Neal was raised in Knoxville, where she appeared in school plays and by high school was spending her vacations in summer stock performances in Virginia. After graduation, she briefly attended Northwestern University, but dropped out and came to New York, where she made her Broadway debut at 20, in Lillian Hellman's Another Part of the Forest. Her performance won Neal her first Tony Award for Best Actress, and she soon signed a contract with Warner Brothers and came to Hollywood. In her film debut, she played Ronald Reagan's fiancé in the rather unfunny comedy John Loves Mary. During and after starring in her second film, Ayn Rand's The Fountainhead, she had a five-year affair with her co-star Gary Cooper, ending it only when she came to realize he would not leave his wife. In one of the great science fiction films, 1951's The Day the Earth Stood Still, she saved the world by uttering the words: "Klaatu barada nikto." In A Face in the Crowd, she was treated poorly by Andy Griffith but retaliated. In Breakfast at Tiffany's, she played George Peppard's doting benefactor. She won an Oscar playing maid, housekeeper, and object of desire for Paul Newman in Hud. In In Harm's Way, she played a military nurse who fell for John Wayne. For 30 years, she was married to author Roald Dahl, though their marriage was filled with tragedy. Their infant son was left brain-damaged when his baby carriage was crumpled by a Manhattan cab in 1960. Two years later, their 7-year-old daughter contracted the measles and died. Three years after that, at the age of 39 and the height of her career, Neal suffered three strokes in one evening. While she was hospitalized, the showbiz tabloid Variety mistakenly reported her death. Dahl oversaw her therapy and recovery, in a manner some -- but not Neal -- called tyrannical and overbearing. She was the grandmother of British supermodel Sophie Dahl. She returned to the screen in The Subject Was Roses, giving an Oscar-nominated performance as the troubled mother of Martin Sheen and wife of Jack Albertson. In the 1971 pilot episode of The Waltons, Neal played Momma Walton, although the role was played by Miss Michael Learned when the series was picked up. Neal continued working until her death in 2010, albeit mostly on television and in lesser films. She devoted much of her time and energy to developing the Patricia Neal Rehabilitation Center in Knoxville, a facility nationally recognized for its rehabilitation services for patients with stroke, spinal cord, and traumatic brain injuries. She also made innumerable charity appearances at fundraisers for stroke victims. The story of her post-stroke rehabilitation was made into a telefilm, The Patricia Neal Story, in 1981, with Glenda Jackson as Neal and Dirk Bogarde as Dahl.